NOW: Jean Sherrard used his ten-foot extension pole again to reach an altitude more in line with the old grade of Third Avenue before its reduction. Yes Jean and we will keep to Third Avenue, or not stray too far from it. First with the help of Ron Edge of our sometimes feature, “Edge Clippings” and our maps too, here are a few links to past blog stories that include within them at least some Third Avenue subjects. May 8, 2011 - Looking North on 3rd Ave. Continuing on, here follows a sampler of Third Avenue subjects. 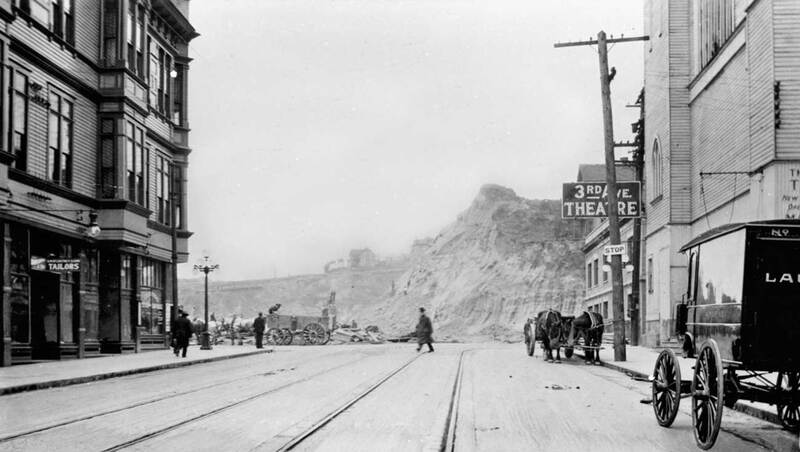 Looking east and a little south from 2nd Avenue to 3rd with the Madison Street regrade on the right and the 3rd Ave. Theatre at the northeast corner of 3rd and Madison on the left. Top-left is a peek at the Lincoln Hotel, which we will return to at the end of this string. The intended subject here is the apparatus of the Madison Street cable line, exposed during the 1906-07 regrade of Third Avenue. 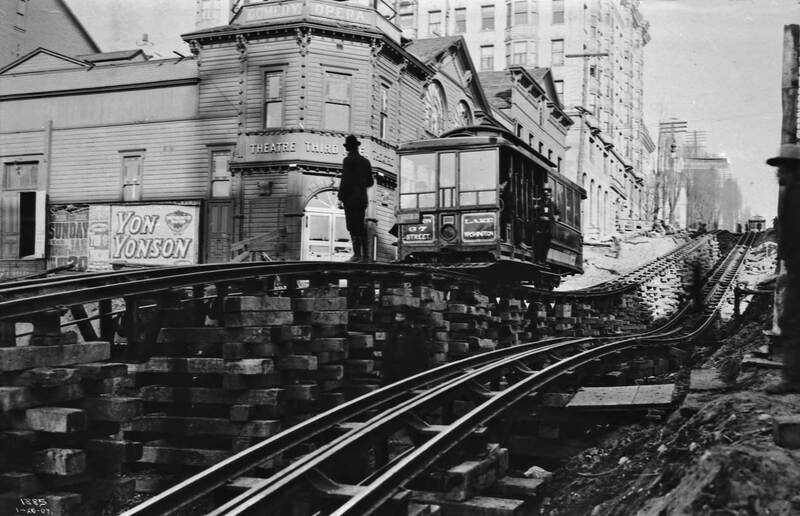 We can see the cable beneath the center slots for both tracks, and the supporting architecture is extraordinary – stacked 6-by-6-inch timbers hold the cable car on the westbound track while Third Avenue is lowered beneath it. light behind the cable car. When the regrade on Third Avenue reached a level where theatergoers could no longer reach the front door, the theater went dark. The caption to The Times’ photo reveals that the theater’s managers, Russell and Drew, are about to tear it down. The Third Ave. Theatre at the northeast corner of Madison St. and Third Avenue before the regrades. 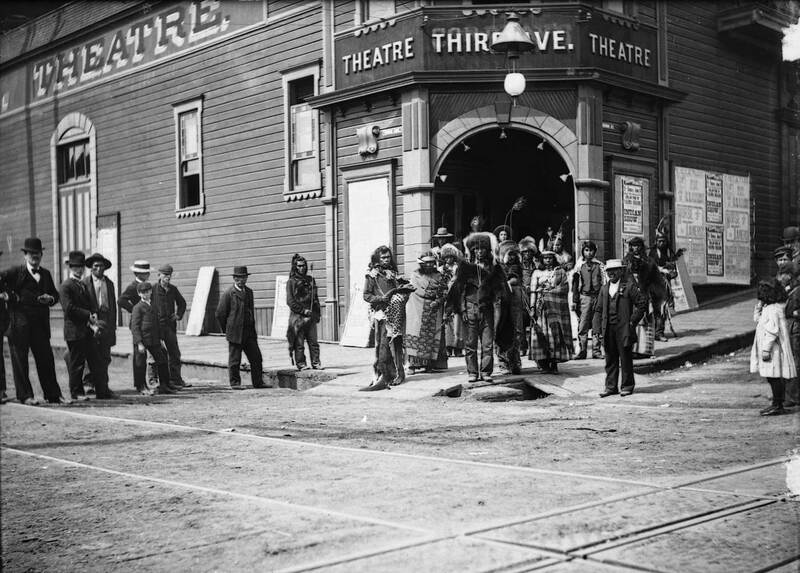 The Native Americans posing in front of the Third Avenue Theater are Yakimas who performed on the theater’s stage Sunday, June 6, 1897. The montage of posters on the Madison Street side of the theater give the day and month, and Eugene Elliott’s “A History of Variety Vaudeville in Seattle” gives the year in its appendix of performances. At the time the Third Avenue was run by impresarios Russel and Drew, who held true to the successful family formula inaugurated by showman John Cordray. 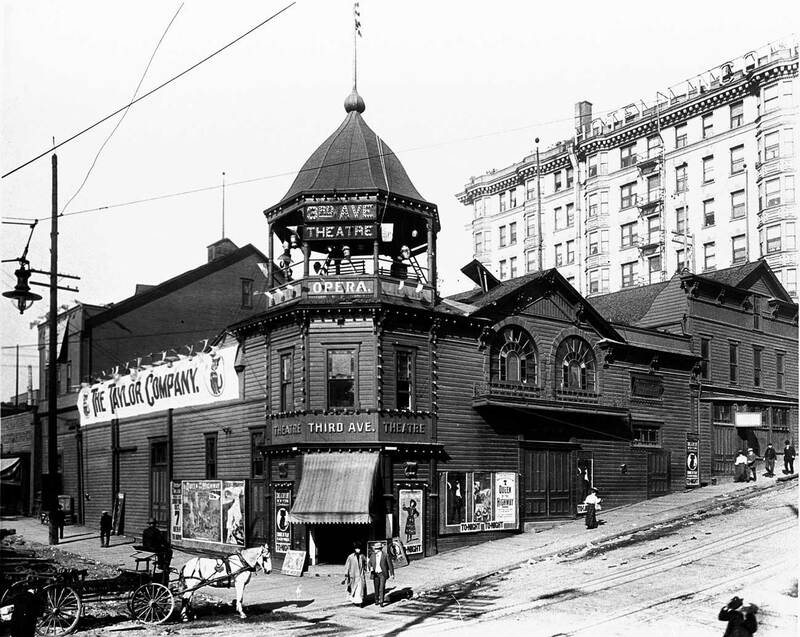 Opening the theater in 1890 under his own name, Cordray offered Seattle its first “polite vaudeville,” where liquor, catcalls and the stamping of feet were forbidden. 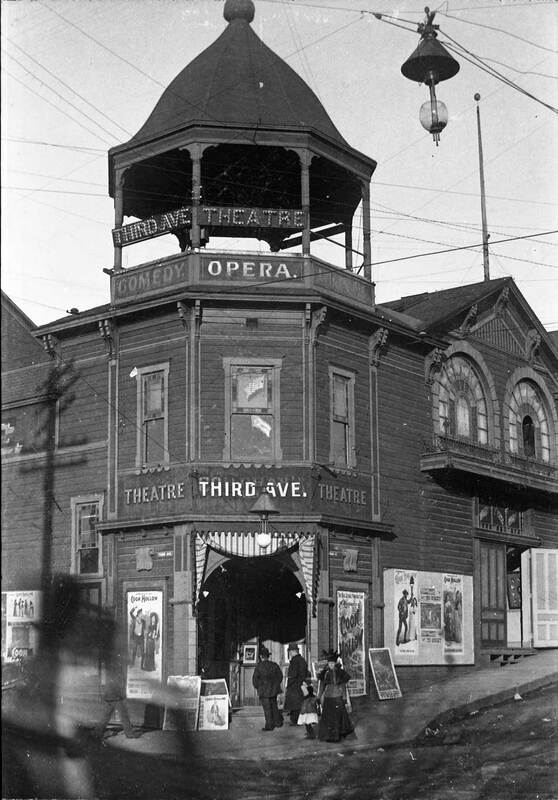 The Third Avenue had two stages, one for variety shows – like juggling and dancing – and the other for plays usually performed by the theater’s own stock company. Occasionally, special acts such as the Yakimas (aka the Yakamas) would appear. By the 1890s the memory of their resistance to the miners’ and settlers’ efforts to take their lands 40 years before had developed into a generally noble impression of the Yakimas’ courage, skills and loyalties. On their large reservation the Yakimas were able to resist their enculturation into the revolutionary changes occurring in the surrounding society. Exhibits of the tribe’s native skills appealed to non-native nostalgia and yearnings for a lost innocence. The Third Avenue Theater survived till the Third Avenue Regrade, when its last stock company moved up the avenue in 1906 to Pine Street and the Methodist Protestant church remodeled for melodrama. The Third Avenue Theatre still on Third but moved here to the old Methodist Church at the southeast corner of Third and Pine. The Methodists had moved to Capitol Hill. Beyond third is the roughage of the Denny Regrade still a work-in-progess here, although well along in reducing the hill to its current grades. 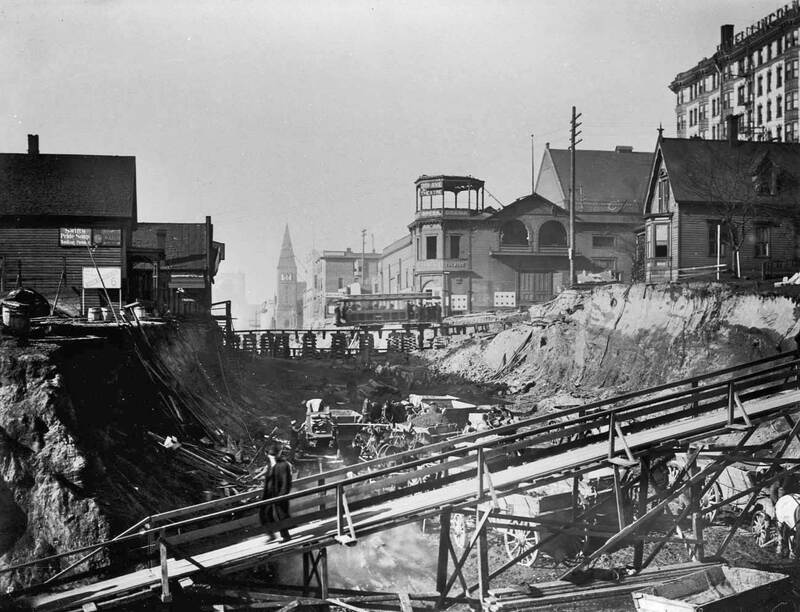 The deepest cut was below the Madison Street cable car that passed over Third Avenue on a temporary wooden trestle shown here near the subject’s center. The pedestrian trestle in the foreground followed the line of Marion Street. 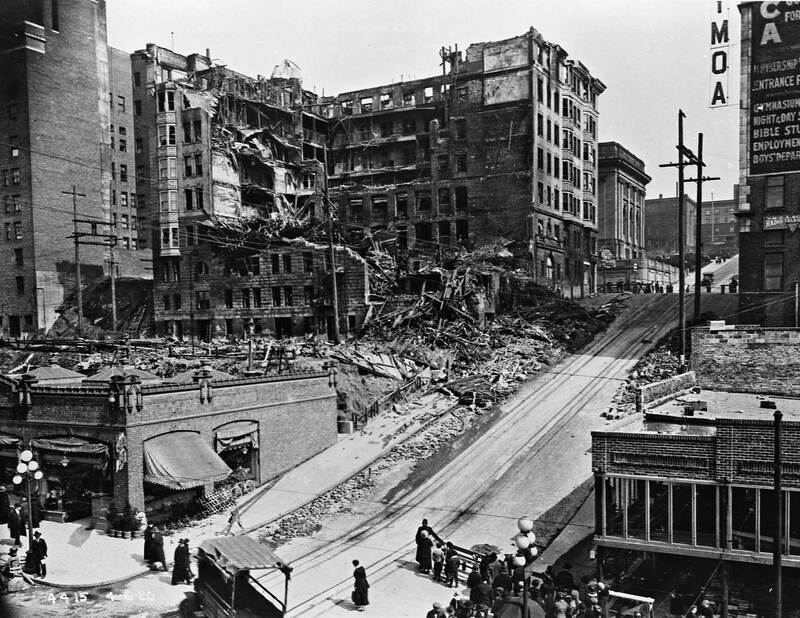 The Third Avenue Theater did not survive even the Third Avenue regrade. 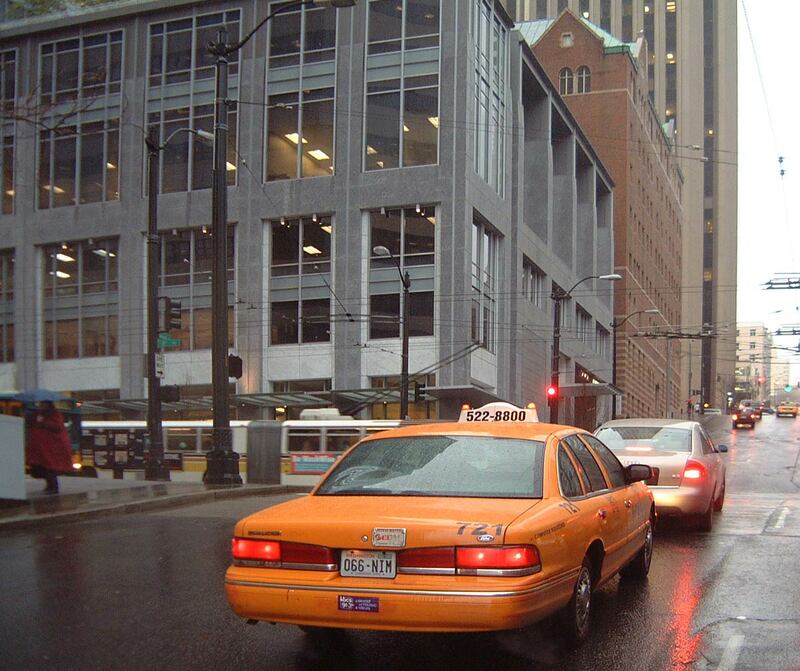 In the historical scene, the theater is above the cable car, at the northeast comer of Third and Madison, the present site (in 1984) of the Seattle First National Bank tower. The theatre has lost the top of its corner tower. 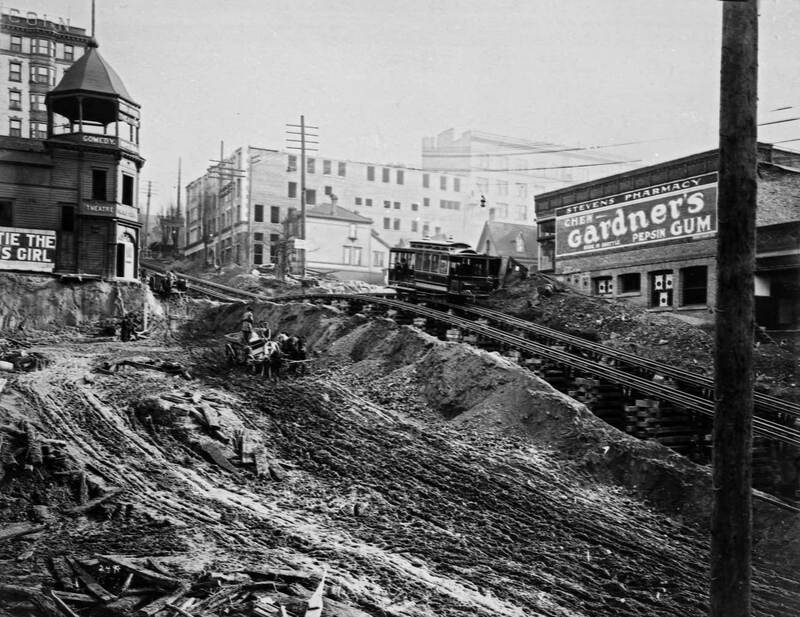 The home of Seattle’s first stock theatrical company, it ran its fare of farce and melodrama for 16 years until the regraded 17-foot cliff at its front door made it impossible for theatergoers to get into the show. 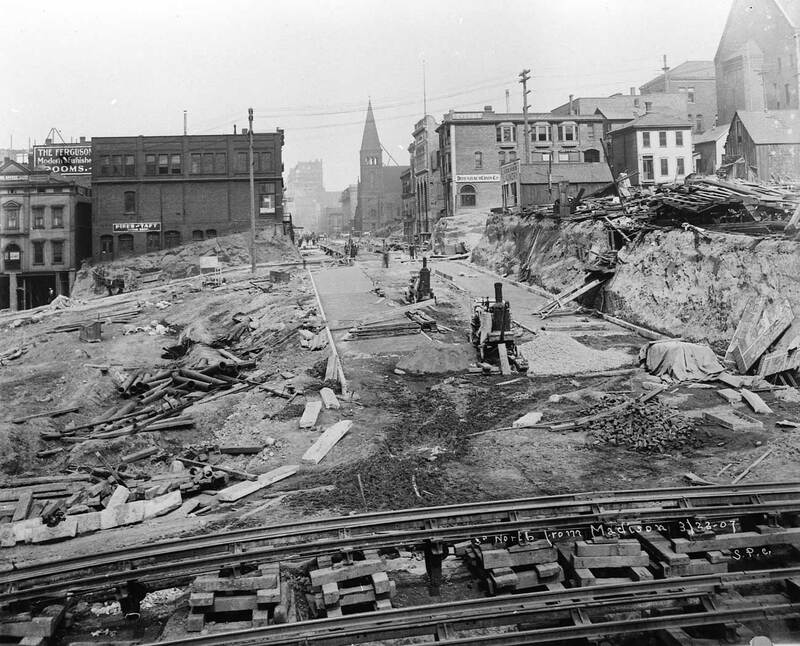 Up Third at University Street” the digging didn’t go so deep and Plymouth Congregational Church kept its services going beneath the tall brick tower seen above the cable car. We peek up Marion to its intersection with 3rd Avenue and thru the Vancouver B.C. 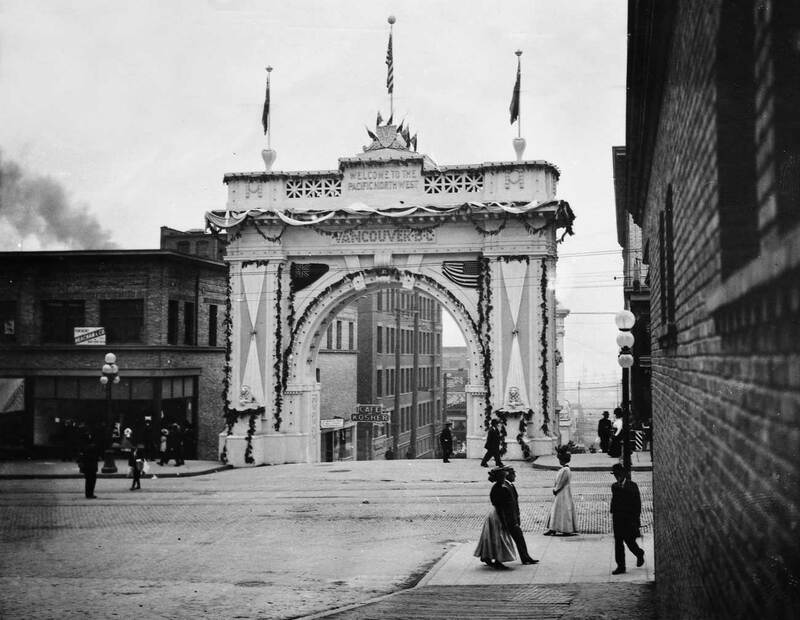 arch, the Canadian supporter-boosters raised as their part of the 1909 Alaska Yukon and Pacific celebration here in Seattle. 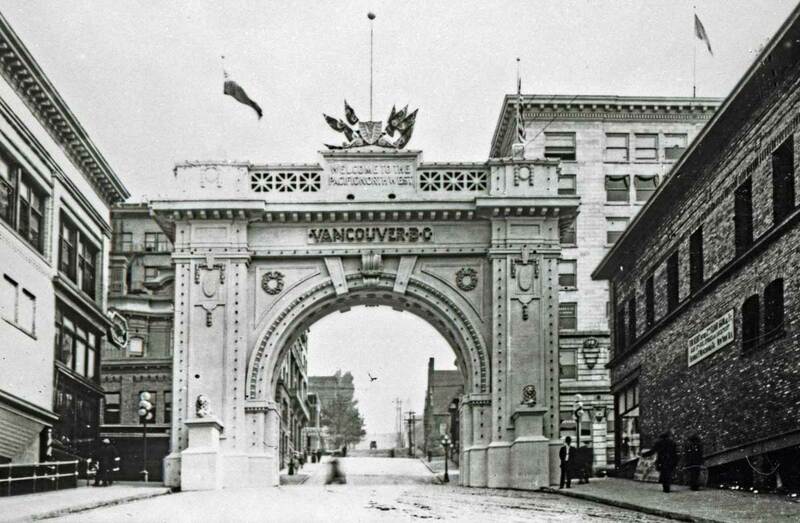 The city of Vancouver’s classical arch at Third Avenue and Marion Street holds its dignified place in the history of ceremonial monuments on Seattle streets. The Canadian monument was erected for the Alaska Yukon and Pacific Exposition (AYP), which remade the University of Washington campus into a gleaming white city, and added a few downtown attractions, such as this, as well. Mayor Douglas concluded by making an ironic lesson of the 500 white-helmeted British Commonwealth troops in his entourage. 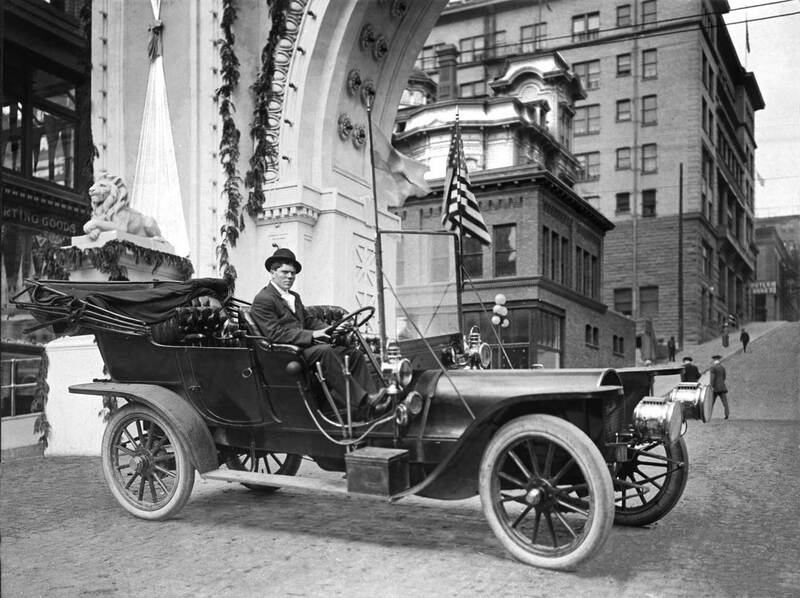 “Evidences of this peaceful feeling have been made all the more pronounced today by the landing of British troops under arms on American soil.” Seattle Mayor John F. Miller accepted the arch on behalf of Seattle. For all its monumental girth, this arch was razed with the AYP’s closing at summer’s end. Soon the demands of the motorcar would make, with few exceptions, such ceremonial obstructions a charm of the past. 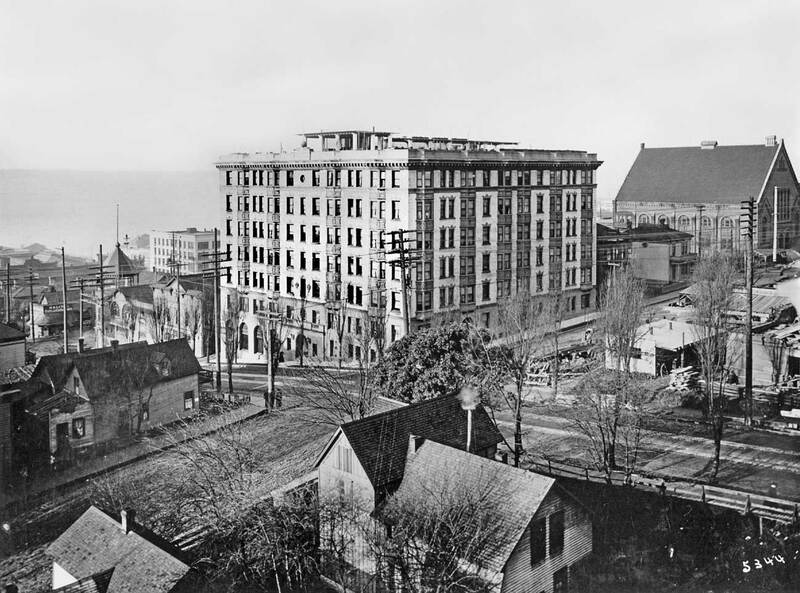 When it was built in 1899, the Lincoln was Seattle’s most elegant and prominent hotel. 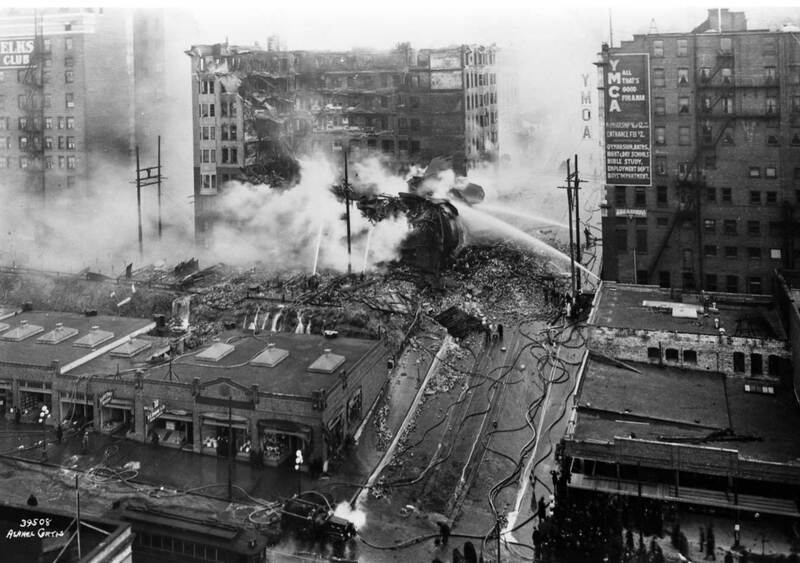 Reaching nine stories high, it was taller than the buildings down around Pioneer Square and taller than those along the city’s growing commercial strip – Second Avenue. The hotel’s elevated setting at Fourth Avenue and Madison Street also made it seem monumental. The Lincoln, made of white brick and stone, glowed when the sun set. The stately poplars on Madison Street once continued up the street past Boren Ave. 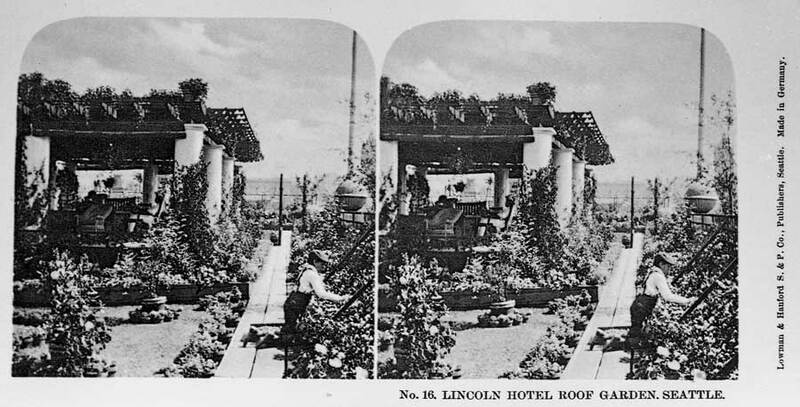 The Lincoln had a garden on its roof. The vine-snarled trellis of the was slightly visible from the street. 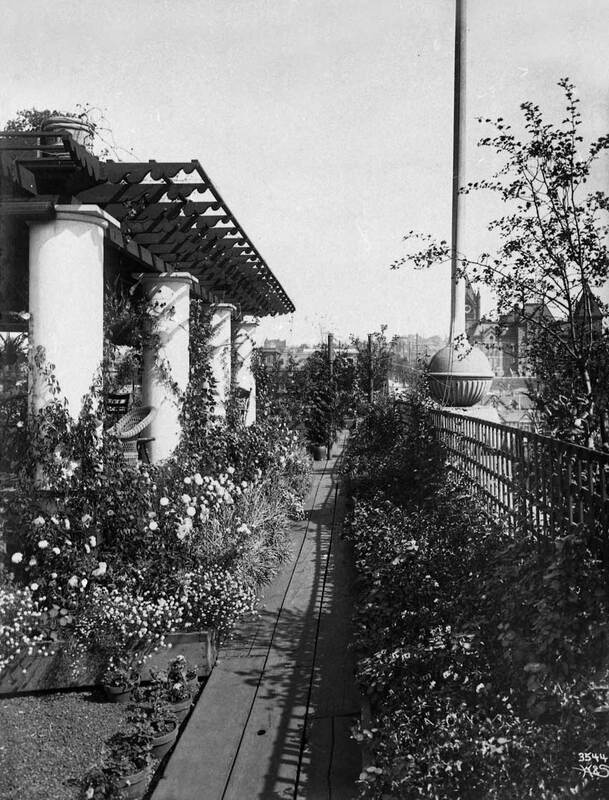 The garden was mostly enjoyed by registered guests, although painted post cards of the garden were for sale in the lobby. The above view looks southeast toward the top-heavy cupola of the county’s courthouse (upper right) on First Hill. There on the courthouse roof is the clue that helps date this photo. Barely showing through the haze is a giant welcome sign, set there in 1908 for the Puget Sound visit of Teddy Roosevelt’s Great White Atlantic fleet. The other closer and more classical dome sets atop the United Methodist Church at Sixth Avenue and Marion Street – and still does. In1908, the sanctuary was still under construction; the congregation worshiped in the basement. Now the landmark gives some architectural soul to a neighborhood of skyscrapers. A retouched pan of the Lincoln Hotel and its neighbors, the Carnegie Library on the right and the YMCA on the left. The view looks northwest through the intersection of 4th Avenue and Madison Street. 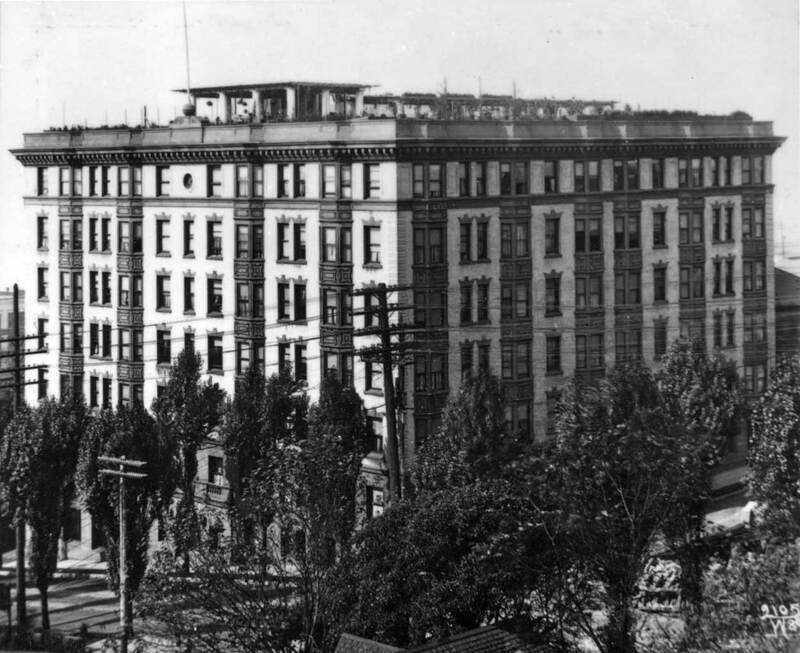 When it opened in 1900, the Lincoln was Seattle’s first apartment-hotel. But it didn’t stay that way. The position that gave it prominence on the city’s skyline also put it too far away from the city’s commercial district. The Lincoln was soon converted into a straight commercial hotel, but faltered in this role as well. The business passed through several managers and owners. 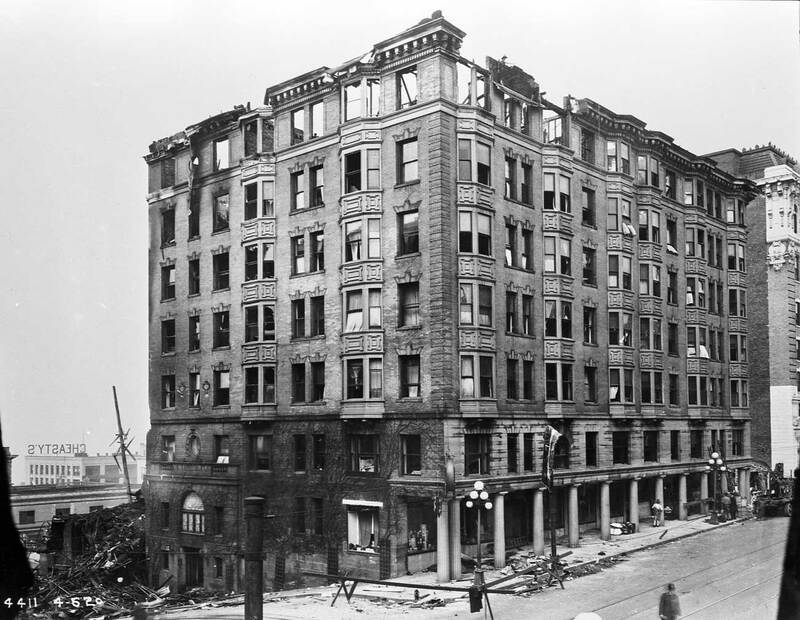 The last was the Madison Realty Company, which bought the hotel on Nov. 1, 1919 and proceeded to sink $75,000 into remodeling the rooms as well as the shops and restaurant on the main floor. On the morning of April 7, 1920, in the first hour after midnight, Mrs. C.A. Gross, proprietor of the cigar store, and Mrs. T., Waters, owner of the beauty shop, met for a moment in the hotel lobby before leaving for home. Their chat was quickly concluded when a man rushed by crying, “Fire!” Within the hour, the Lincoln – brick on the outside but wooden within – was a furnace. 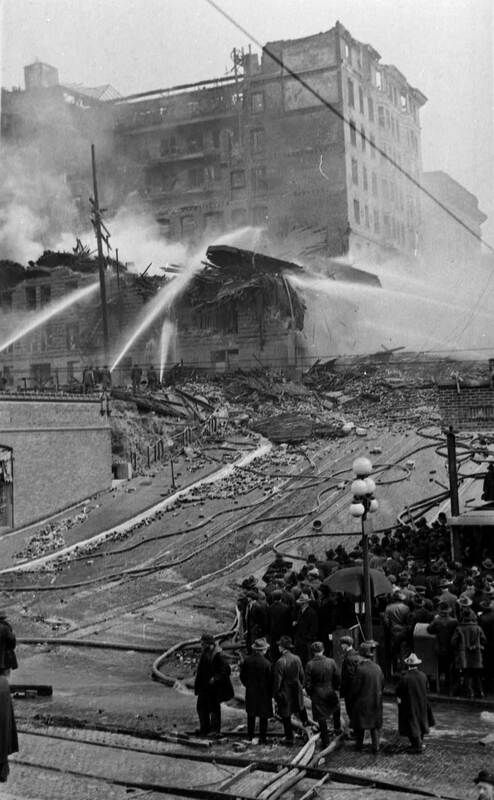 The hotel was lost including three of its guests and one firefighter. 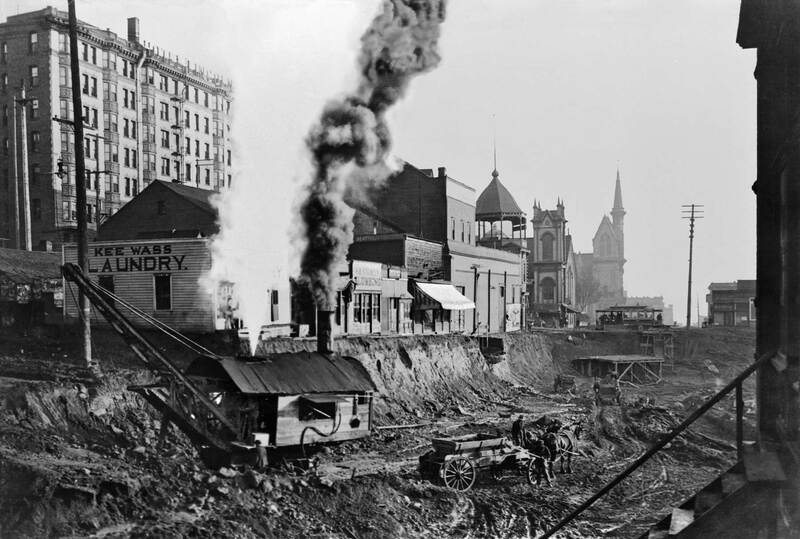 The water dumped on the fire created a river down Madison Street and Third Avenue. It was the last watering for the Lincoln’s roof garden. First named the Knickerbocker because of its association with Dr. Rufus Lincoln, the New Yorker who financed it, the landmark hotel at Fourth and Madison opened in 1900 with elegant exterior walls of gleaming white brick trimmed with stone. Later the family name seemed more fitting for what its managers claimed was the first apartment hotel north of San Francisco. 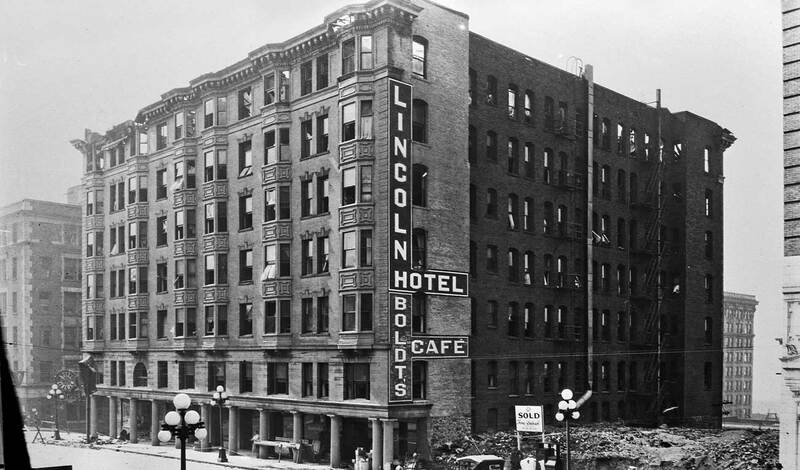 Although the Lincoln Hotel was designed with two-and-three-room suites to attract a patronage with the means to stay a while, they did not, partly because of the struggle required to reach it. 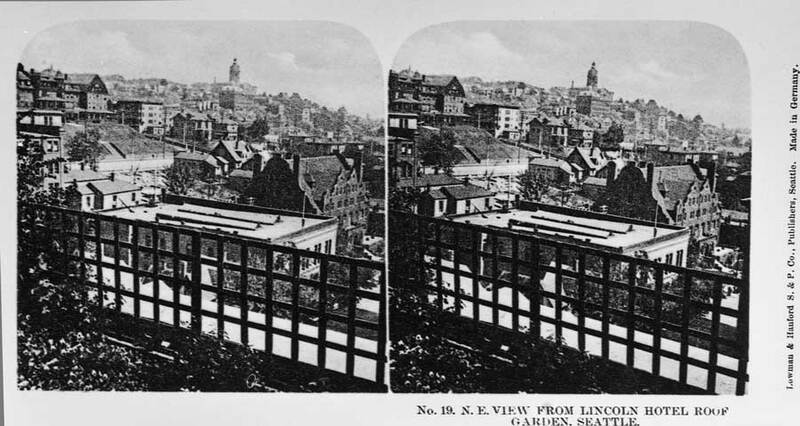 The two blocks that separated the Lincoln from the developing commercial strip, Second Avenue, were – for the cable cars that climbed them – among the steepest in the nation. The Lincoln switched to standard hotel service. Looking east up Madison Street. The Elks Club is on the left and the YMCA on the right. As guests discovered on the early morning of April 7, 1920, the hotel’s elegance was skin deep. It was “little more than a lumber yard with four brick walls around it ” as the fire chief later described it to a Times reporter. 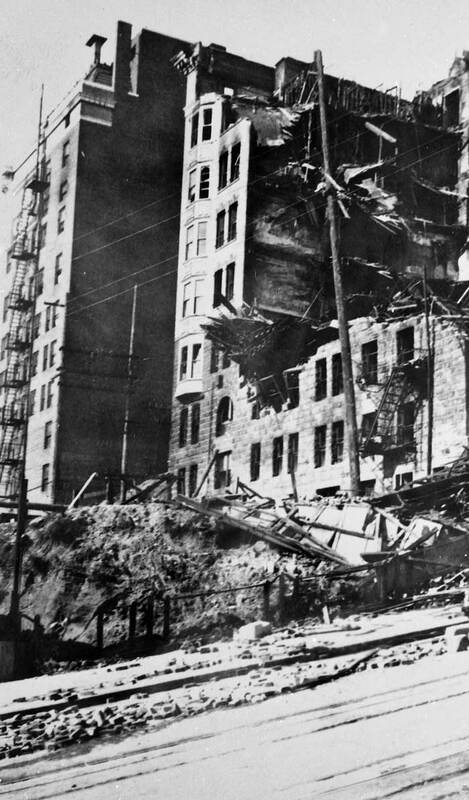 By the night clerk’s estimate it took only five minutes from the moment he heard an “explosive thud” in the basement for the smoke to climb the elevator shaft and make impossible his efforts to warn by telephone the nearly 300 mostly sleeping guests. 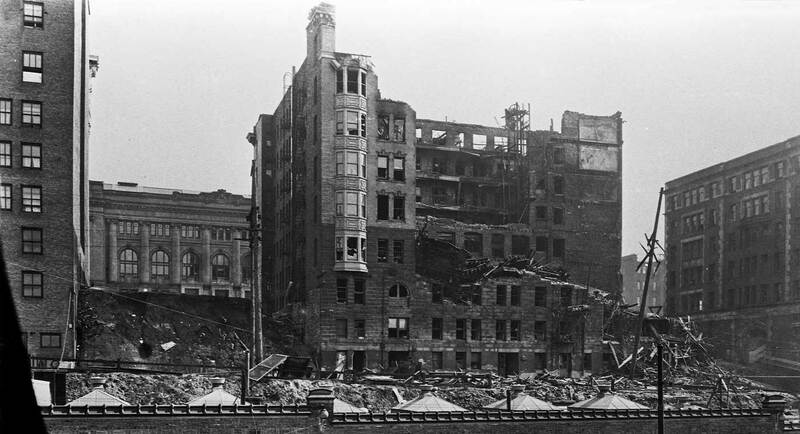 Looking east across Third Ave. to the ruined west facade of the hotel with the YMCA on the far right, the Elks Club on the far left, and the Carnegie Library across 4th Ave. showing between the hotel and the club. The Lincoln looks deceptively whole - except for the light in the windows - from this prospect looking across 4th Avenue. The Elks are now on the right and the Young Christians on the left. Third Avenue never ceases to fascinate me. Lots of fun here. 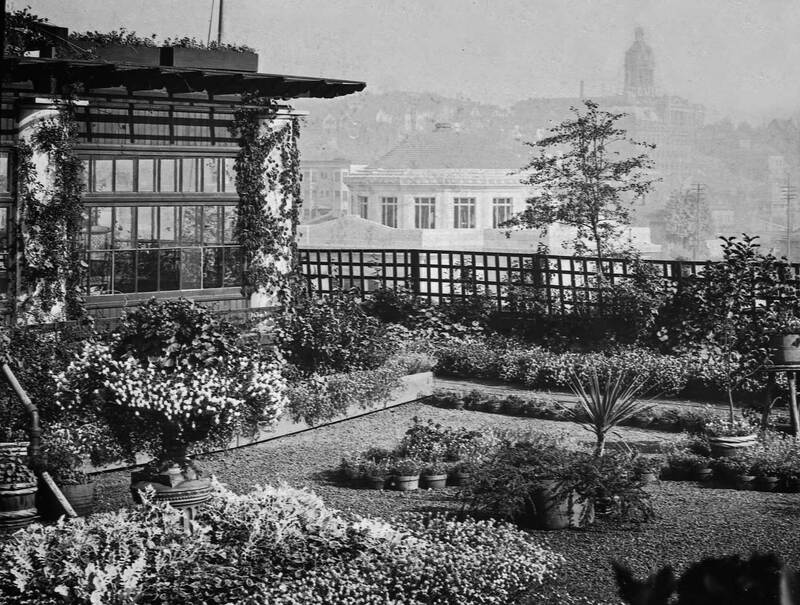 I knew there was a garden atop the Lincoln but I had never seen these particular photos before. Thanks for posting these! 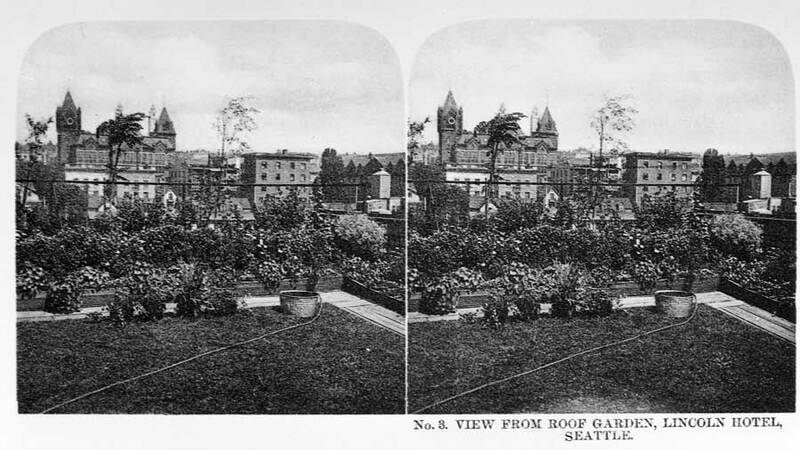 In the first photo, what is the building whose dome you can just make out through the belfry of the opera house, up on Fourth at Columbia or so? Sorry about my tardiness in responding. I’ve been in the crush or rush of finishing something else. Deliberating on your question I cannot figure it out. What counts as the “first photo” and what belfy on what opera house. Do you mean the tower-bellfry (sort of) on the Third Ave Theatre (which is in the top most picture. But from this prospect I cannot make out anything on 4th and Columbia. What replaced the Hotel Lincoln? 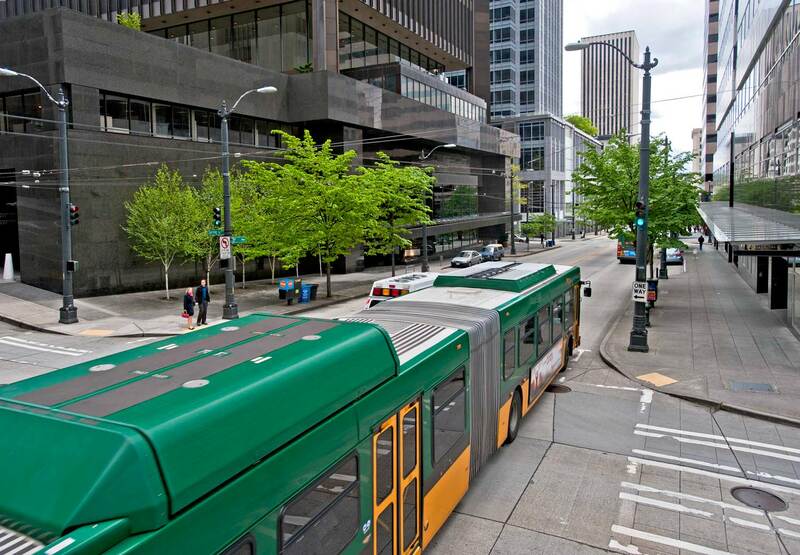 That’s the site of the Seattle First National Bank building/Safeco Plaza? What was there between the 20s-60s?